Guide: Today, functions of mobile phone turn to more and more powerful, it is no longer just a convenient communication tool, all aspects in people’s living have close relations with mobiles, perhaps in the near future, mobile phones can help people to detect various diseases anywhere and anytime, which will be more conducive to help people to prevent and diagnose various diseases, thus produce more benefits to people's health. Mobile phone technology is quickly changing the way the world operates. Today, we tell about two new projects involving mobile health, also known as m-health. Doctors and technology experts in London are developing a new way to test for sexual infections. The new device uses mobile phones and computers to help people find out if they have been infected with a sexual disease. People will be able to perform the test in the privacy of their own homes. People place urine or saliva on a small piece of paper. They place the test strip in a small device that contains a computer chip. Then they place the device in their mobile phone or a computer for testing. Within minutes, they receive information telling them if they have a sexual disease. And they receive advice on what to do next. Claudia Estcourt is with Barts and The London School of Medicine and Dentistry. She is also part of the research team working on the project. CLAUDIA ESTCOURT: "This isn't designed to replace traditional clinics. This is really opening testing up to people who might find it embarrassing or difficult to get into their clinic. And this might be a much quicker, easier option for them --- that they can be assured of very accurate results." Health experts say many young people are too ashamed to visit a clinic to be tested. This increases the risk of them passing on sexual diseases. The researchers hope the tests will help persuade people to be tested and reduce the number of sexually transmitted infections. Dr. Estcourt says the project is still seven to ten years away from completion. But she says it holds great promise for the future. CLAUDIA ESTCOURT: "Clearly one of the major implications of something like this would be for use in developing countries: maybe for testing HIV, maybe for testing for tuberculosis, or perhaps even malaria." Researchers at the University of Toronto in Canada are studying a mobile phone system that may help people with diabetes control their blood pressure. 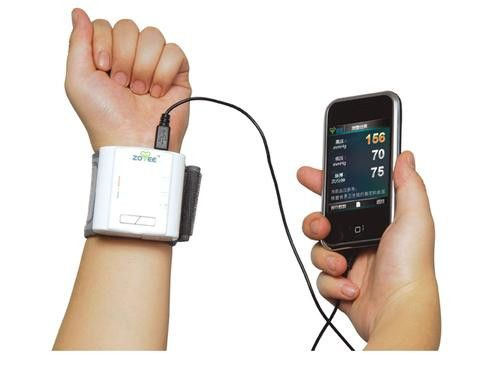 The system collects blood pressure readings from home testing devices that have wireless technology. The readings are then sent to a health-care monitoring system. Patients receive a mobile phone message telling them how they are doing. If their blood pressure is too high, they are advised to make an appointment with their doctor. Several high readings will cause the system to automatically contact the doctor. Patients in the study used the mobile phone system for one year. The researchers found that thirty-seven percent of the patients were able to get their blood pressure under control. This compares with about fourteen percent of patients using common equipment.